I’ve been intrigued by caramel cakes because of the frosting, for which you basically make caramel, let it set, then whip it vigorously until it becomes lighter and fluffier. There are a number of recipes out there for caramel cakes, most of which seem to have been inspired by The Help. Not many of those recipes create a caramel base for the frosting, instead taking a short cut using evaporated or sweetened condensed milk. This frosting recipe is not quite as challenging as some appear to be, but similar enough to achieve the desired result. I’ve been having a heck of a time with the temperature of my oven lately. I figured out that it has been low on temperature, explaining why baking times seem to drag on and on, so I adjusted it. But, I still had some trouble getting the oven to maintain a relatively consistent 350 degrees. It started out a little too hot, then got a little too cold, and finished just right. So, as a result, I think the edges raised up a little bit, started to burn, and separated from the rest of the cake (as you can see). The cakes still baked nicely and had a great color. Instead of just making a caramel cake, I thought it would be cool to make a caramel cream cake, like one of these in cake form. So, I found a recipe for Holland Cream, wanting to create a frosting filling that is similar to that inside a donut or a lobster tail. It was good, but not great (maybe it needed more vanilla). I’ll have to tinker a little more with the recipe. The caramel frosting was pretty easy to make as it happened. I let it cool a lot longer than the recipe indicated because it was still quite warm after 15 minutes. But it really whipped up nice anyway, and it was really easy to frost the cake. I’m getting much better at frosting cakes, and this icing made it much easier because it was so thick. I was able to get the frosting nice and smooth, just like one of the candies! Ha. This caramel frosting is unreal. It’s probably on the Mt. Rushmore of my favorite frostings ever. My wife thought it was so good that she was eating it out of the bowl (which she never does), and she kept the leftover frosting with no idea when or how she would eat it. 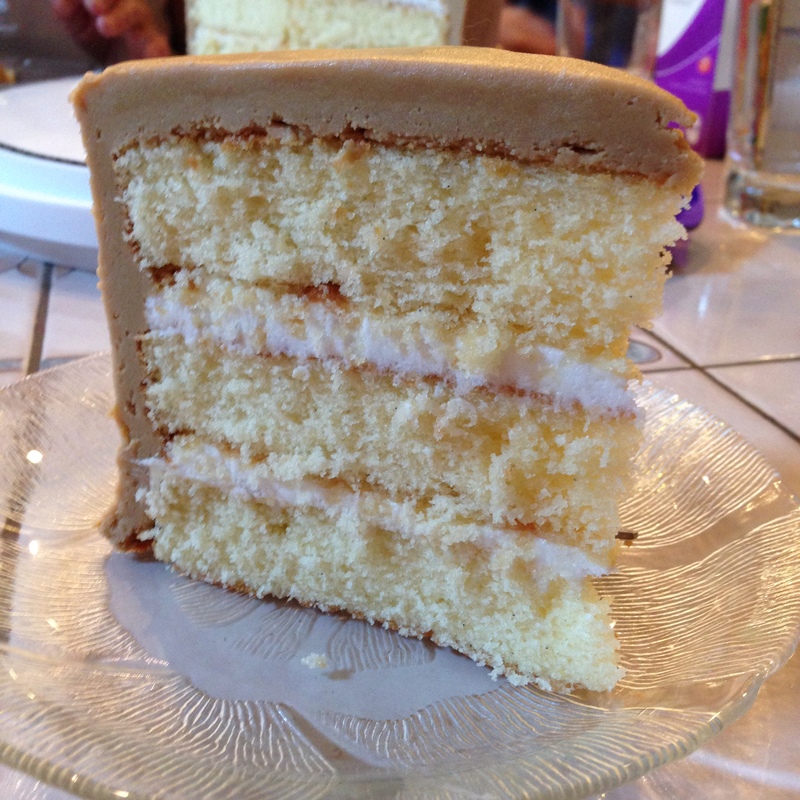 The cake was nice because it wasn’t overly sweet and was a perfect offset to the caramel frosting. Some cake testers thought that the cream was a good complement to the caramel frosting, almost a break from the caramel frosting. I think the next time I make this cake, I’m going to frost it with caramel all around. I’d probably need to scale the frosting recipe up just a little bit to do this, but it might work if I was stingy (which I shouldn’t be). This cake and frosting are real keepers. In a medium bowl, whisk together the flour, baking powder, and salt, then set it aside. Cream butter and vegetable oil in a stand mixer on medium-high speed for 5-7 minutes, then add sugar and continue mixing a few more minutes. Add eggs, one at a time, mixing on low speed until just incorporated. Add a third of the flour mixture, mix until combined, add half of the milk, mix until combined, add a third of the flour mixture, mix until combined, add the remaining milk, mix until combined, then add the remaining flour mixture, mix until combined (and scrape down the sides with a spatula). Fold in the vanilla bean paste. Pour batter into cake pans. Bake for 20-25 minutes or until toothpick inserted into the center comes out clean (I used cake strips, and it took 25 minutes). Allow cakes to cool for 10 minutes, then flip onto wire rack to cool completely. For the filling: In a small saucepan over medium heat, dissolve the sugar into the water until the mixture is boiling. Remove from heat and let cool completely. Pour this simple syrup into the mixing bowl of a stand mixer, and beat in the vegetable oil, shortening, and vanilla bean paste on medium-high to high speed to blend well. Add 1 cup of powdered sugar at a time, mixing in between each addition, until the filling is thick and fluffy. Apply the filling between layers of the cake, then chill in refrigerator while the frosting is prepared to firm it up.